Msbelle and Pamela sent me a ton of possibles for this year's Oscars, so if any prominent Hollywood stylists are reading this blog, here's all your work done for you, by them. Click on the image to check out the front, which is just as stunning. 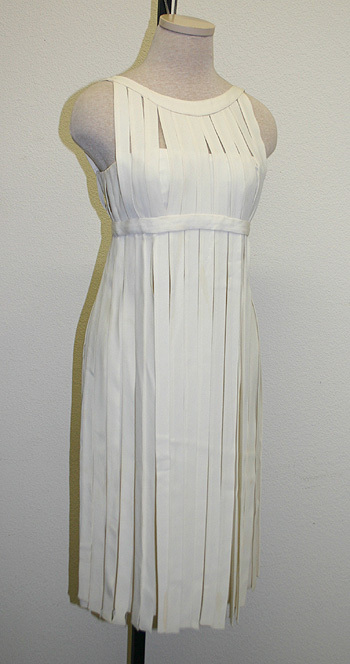 Pamela also suggests this Ceil Chapman dress, perhaps for Renée Zellweger? I see this on someone a bit edgier, maybe Cate Blanchett? Although this is only 55" shoulder to front hem, so perhaps you don't have to be a total glamazon to wear it. This one (also suggested by msbelle) is 100% Jennifer Garner. Don't you agree? I can't even express how much I love this Elie Saab one msbelle sent. The gray! The bands! 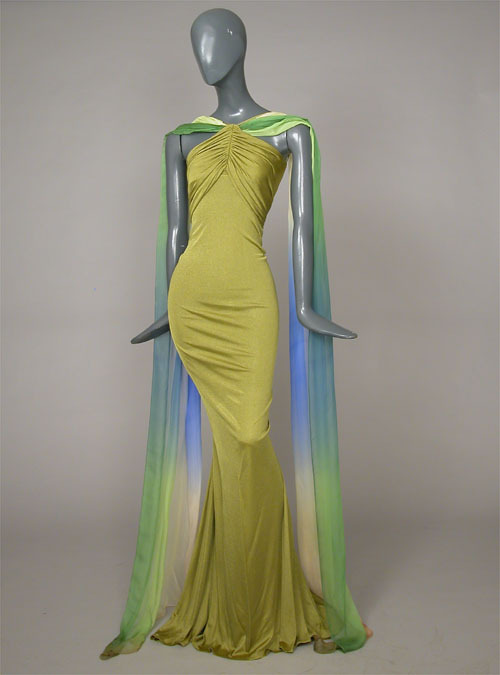 This one is really gorgeous, too, but I can't imagine who would wear it. Nicole Kidman? I think she had her fill of this color a few years ago. 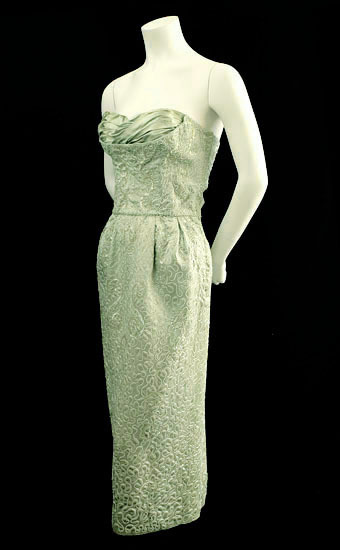 Got a vintage dress to match with a celebrity? 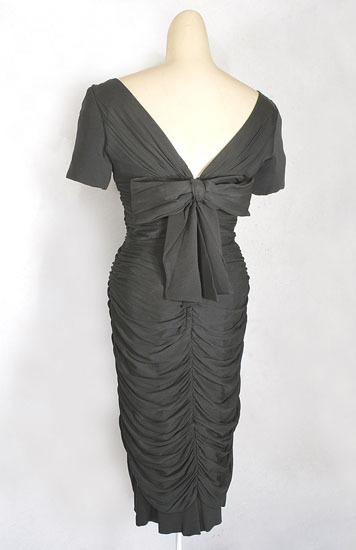 Or a celebrity to match with a vintage dress? Play along in the comments! The cream pleated one looks like Halle Berry to me! I gasped when I saw the black dress. Stunning, simply stunning. And perfect for Angelina Jolie. I could see that last one on Hilary Swank. I don’t even know why I thought of her. This was a really clever post. You are really perceptive and a good writer. Have you ever thought about writing about fashion for People or similar publication ? The one you’ve suggested Cate Blanchett for I could also see on someone like Kirsten Dunst/Natalie Portman. But maybe that’s just because I’ve seen them in similar dresses before and found it lovely. I hope we get to see Angelina Jolie in that dress. She certainly has the figure for it. What about this one for Nicole Kidman How about this one for Nicole Kidmanor this one for Halle Berry? While I love the dress for Cate Blanchett, it may be a little to reminiscent of the dinner party dress worn by Kate Winslet on Titanic. Do you think? I think Joss Stone would wear the final dress. She seems to like prints. Oh no, not a short dress for Angelina. She doesn’t have good legs – she needs a long dress. Well, actually the last one is more Renee Zelwegger. And if J. Lo. is smart she ought to go with the full skirted gray and black. I really like the lacy black edwardian style. But, I don’t know who’s up that could wear it. I imagine Beyonc with the J.Lo dress, actually. And she’d have big beautiful hair to go with it! I think that Angelina’s contract with St. John stipulates that she wear only their clothes to red carpet events, which is a shame because that dress would look amazing on her. Great picks. 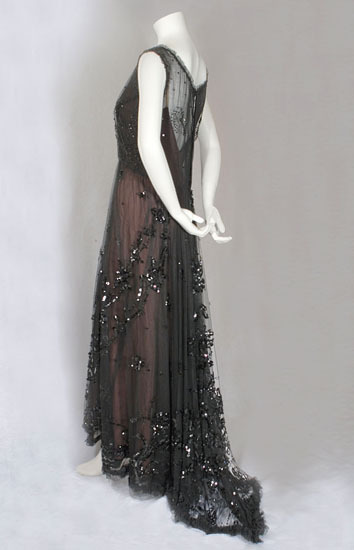 I especially love the black beaded gown, 60’s sheath and the brocade. I agree that the Ceil Chapman would look faboulous on Renee Zellweger! This was so entertaining to read! Beautiful dresses and your commentary and musings are so witty and fun! Do you guys do rental’s…there’s someone’s swwet 16 coming up and I’d like to surprise them with either that mint green or the dark wine colored dress right after the mint green. If so, what are the price ranges…the shipment info…and the dress sizes??? ?